At the moment I am in a training and have very little time to take photos. 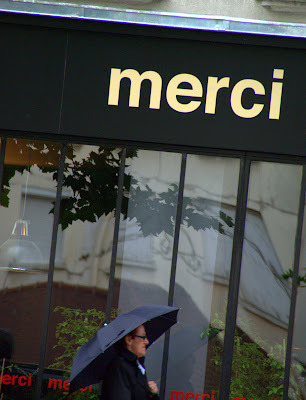 However, today, on my way out from the training place, my eyes noticed the graphics of a shop called Merci. I grabbed my camera and shot without thinking twice! It's only tonight, after I did some research on the web that I found out that this place is remarkable. Merci is a 3 floor store in which all goods (clothes, furniture, kitchen stuff, books...) are made by famous designers/artists/writers... But wait! There is more. All these designers agreed to give up a large part of their mark-up and let the money go to charities. (FYI, it was created recently (March 2009) by the founders of Bonpoint, a children clothes franchise.). One day, I'll go inside and show you more. Merci indeed! What a lovely gesture. Please do go in some day, Eric, and report on all the good stuff for sale. I've missed joining in the conversation the past few days—having very bad komputer karma. Am staying late at work to catch up on all my blog pals (and post my own). Then to the Met (ropolitan Museum) because tonight is Museum Mile, when all the big museums on Fifth Avenue are free from 6 to 9. Anyway, I missed all you guys! Interesting store for sure. And the name must reflect a sense of of gratitude for their success of which they are now returning a part. Awesome! Merci for finding this! And I do hope that "one day" is very, very soon! Eric I'm cracking up at your "But Wait! There is more." line. I hope you're not staying up late watching infomercials. This does sound like a fabulous store, and the charity aspect is nice as well. and "merci a toi" for this photo. i love the reflection of everything around. Alexa you disappear then come right back in and grab GF. Well done! What a good idea, Eric, this charity effort. I too can't wait to see what's for sale. Love the angle and reflections as well as the story behind it. Merci for sharing, Eric. ET Suzy, if you go to Eric's Bonpoint link and click on L'univers Bonpoint, guess what kind of scooter drives across the screen?! What a great idea! I hope the store is successful and I look forward to learning more. Even when you are busy, you always come up with something interesting. I hope you do get a chance to go inside and look around, maybe snap a photo or two , and let us know what you think! still an interesting photo Eric even though you are so rushed with your training. Good luck with that. I will wait for what is inside when you have more time. Merci Eric! Take your time, we know you're busy. I wanted to tell you all about a French film John & I saw last night called L'Heure d'ete (Summer Hours). At first we thought it was so-so, but we keep talking about it, finding more in it. I like it more the more I think about it. It was pleasure enough just to hear people speaking French (I couldn't keep up with a word, it was too fast.) Let me know if you see it. Great concept. I hope it succeeds. I read about Merci recently on Paris Breakfasts and sent my daughter and her friends who are living in Paris...they loved it! Full of fabulous images and ideas...color and inspiration. So wonderful that there are so many things to discover still in Paris! How cool! I love when start something interesting. Can't wait to see inside. C'est bien sûr à vous que je dis merci, Eric. Je suis ce blog depuis maintenant 2 ans environ. C'est tous les jours un bonheur. Je ne connais pas ce magasin, "merci". Il ne faut pas me pousser beaucoup en matière de shopping. Alors, oui, j'irai!! After all these years reading your blog, commenting only occasionally, sadly missing the dates for your picnic each year, to think that I might have passed by you yesterday when my husband and I visited Merci and ate a lovely meal just around the corner at Café des Musées. Perhaps if you return to Merci, you'll be tempted to take a picture of the very cute little red car, filled with plants and flowers . . .
Eric, this is a great shot and you didn't even think about it. The man with the umbrella makes it. MERCI sounds as a great concept - and if they sell great stuff as well it must be the place to go. Petrea, I know what you mean about watching French movies just to hear people speak French even though it's hard to understand. Petrea: I saw Summer Hours. I always go to any French movies playing. My comprehension is poor but I, too, love the sound of the language. We don't get as many French movies as we used to. I saw a lot of them back in the late '70s and early '80s. Thanks for the movie recommendation, Petrea! Materfamilias!!! We ate at Cafe des Musees 2 days ago! It is near our apt. in the Marais and everything looked great so I figured let's go. I had one of my more excellent meals there that day. The white asparagus in a light cream sauce was to die for and the strawberry tarte of the day was oozing of pastry cream. A real find. Did they have the picture of a stuffed animal in the window of the door saying they found dou dou? Try saying that outloud in English like I did(to my husband). .an American walked by just at that moment and started laughing. And now I know where to find Merci!!!!!Merci! PHX, "oui oui" always gets a chuckle out of my daughter. Our waiter at Chez J. Dumonet today was No No, but I don't know how that would have been written in French. Tell your daughter, No No sent her a oui oui. Communicating with people around the world is very comforting right now. Just minutes ago, a crazy white supremecist, over 80 years old, shot a guard inside the Holocaust Museum in Washington DC. Other police shot the whacko. Both are in the hospital. The museum was evacuated. What a statement on those who preach hatred. This stuff disgusts me. Yes, been looking at that, Jeff. Apparently he walked in and started shooting his rifle. There's some talk he'd done something similar years ago too? Nothing official on that though. Sounds awful doesn't it. phx-cdg -- I don't remember the stuffed animal/dou-dou, but I think we'll have to head back there for the asparagus -- my husband's been hankering after the asperges blancs, remembering a beautiful dish he had last year. thanks for the tip!